dumplings | I Am Not A Restaurant! My cast iron skillet hadn't seen the light of day in…well, in so long I can't date it. Talking to Julie Hearne on SiriusXM 110 (The Cast Iron Skillet Cookbook) shamed me into trying something other than fried chicken or corn bread – seriously, the only reasons I bought it. 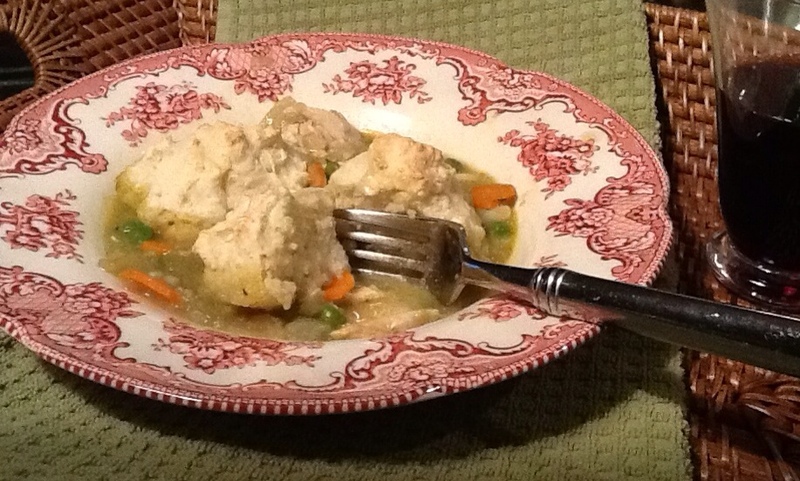 She said make chicken and dumplings and I did! More self-appreciation as I used up a couple of cups of cooked chicken, a handful of frozen peas and the already opened box of chicken stock. Preheat oven to 350. Heat skillet, add oil & onions over medium heat. Soften a few minutes, then add carrots & celery. Salt and cook until tender. Add thyme and flour. Cook a minute or two. Add broth, but not so much it is soupy. It will start to thicken. Add chicken. Cook until bubbly, adjust liquid, re-season with salt & pepper. 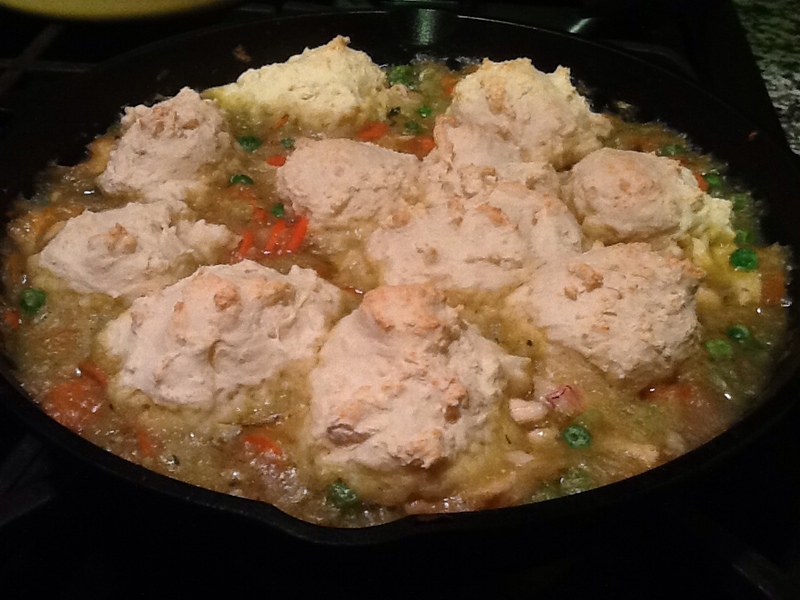 Top with tablespoons of dumpling dough to cover. Bake 350 for 20 minutes. 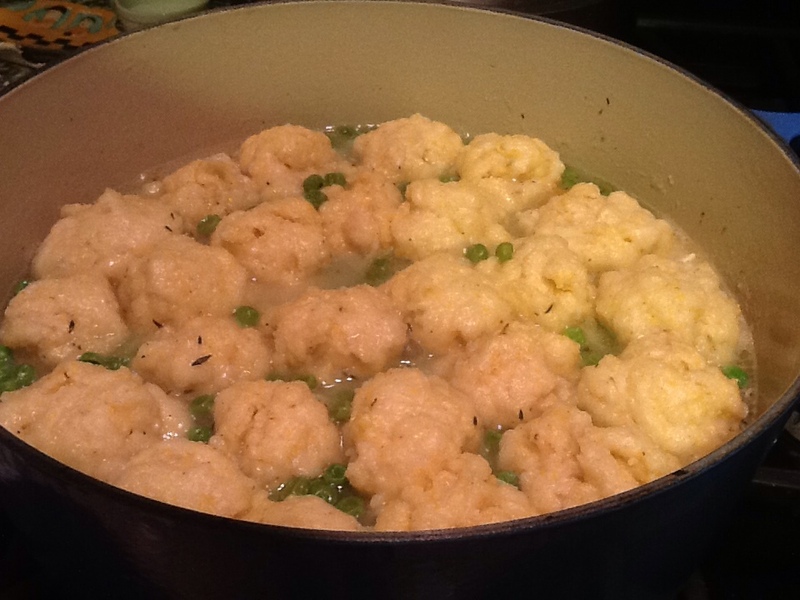 I pulled the dumpling measurements from Martha Stewart, minus the dill I didn't have. It's flour, salt, baking powder, milk.